It’s the end of the second week of the 2013 PokerStars World Championship of Online Poker (WCOOP), and action is thundering on like a rogue rhino in Doc Martins. 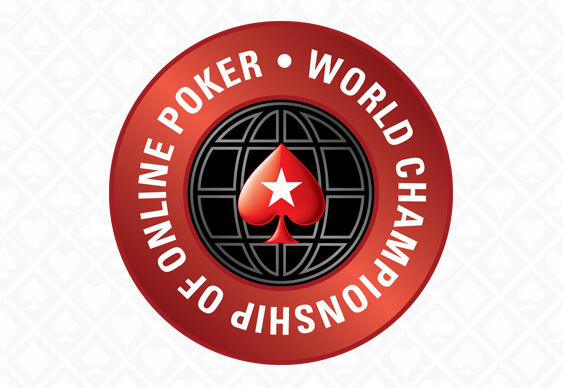 This year’s WCOOP boasted a cracker of an opening week (read our first weekly round-up here), with a rabble of famous pros including Toby ‘810ofclubs’ Lewis, David ‘Gunslinger3’ Bach, and Steven ‘stevie444’ Chidwick all binking sizeable wins. PokerStars Team Pro also celebrated successes with Liv Boeree and Jason Mercier bagging final table spots. As if that wasn’t enough, the $10,300 NL Hold’em High Roller (Event 23 on the schedule) would have been like Christmas come early for railbirds, with a star-studded field featuring Phil Ivey, Sam Trickett and Ben ‘Sauce123’ Sulsky among many others. Well, I hope you like the acquired taste of woolly winter headwear, because the second week certainly didn’t disappoint. Team PokerStars Pro definitely rallied, notching up some impressive performances throughout the proceedings. This included George Danzer, who swiped 2nd place in Event 40 (the $1,050 NL Hold’em 8-Max) for $156,648.47 and narrowly missed out on capturing the third WCOOP winners bracelet of his career. We talked to the German pro about his hopes for this year’s WCOOP a mere month ago, and once again the boy’s done good. Read our George Danzer interview here. Other red spade representatives who had deep runs were Team Online Pro Naoya ‘nkeyno’ Kihara, who came 4th in Event 31 for $15,554.80, and Team Pro Adrienne ‘talonchick’ Rowsome, who managed 5th in Event 33 for $9,870. Notably, PLO beast ‘Yoo4’ was crowned the first double bracelet winner of 2013 after taking down Event 35 (the $320+R PL Omaha 6-Max) for $103,008. The Russian grinder’s first win this series was in Event 16 (the $215 PLO 6-Max), in which he narrowly defeated Team PokerStars Pro and 3rd place finisher Marcel Luske. Other familiar faces appeared in the shape of Tom ‘hitthehole’ Middleton, who placed 9th in Event 30 for $16,933.20 just weeks after his win at EPT Barcelona for €942,000. Drinks on him, then! Middleton was joined by Darren ‘darrenelias’ Elias, who won Event 34 for $76,032 after refusing a deal, and ‘mypokerf’, who won Event 39 for $91,829. Elias won the WCOOP $10,300 High Roller Event in 2012 for a mouth-watering $574,695, while ‘mypokerf’ already has numerous Sunday Million and Super Tuesday titles. Speaking of famous names, many of them ended up clashing in Event 37 (the $215+R NL Hold’em), which featured a fearsome final table. Amid the line-up was a collision of old and new, with current Team Pro Bertrand ‘ElkY’ Grospellier sat next to former Team Pro Jude ‘j.thaddeus’ Ainsworth. 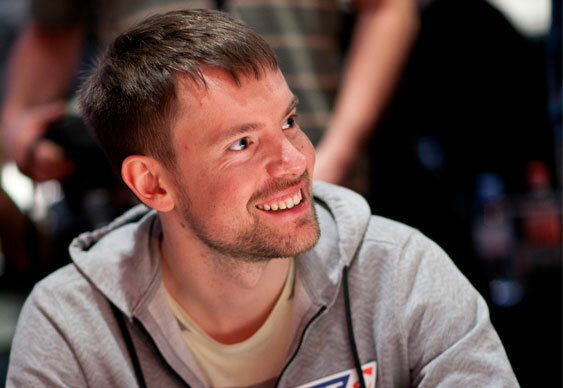 Among the rest of the final nine were ‘Syndrome1977’, ‘zcedrick’, and ‘Mendezoo’, all of whom have achieved six-figure scores in previous PokerStars tournaments. It was Sunday Warm-Up winner ‘phaplap’ who emerged victorious however, bringing home Turkey’s first ever WCOOP bracelet and a healthy $117,946.52 for his time. More explosive action ensued when Daniel ‘mrGR33N13’ Colman smashed through a stellar field in Event 44 (the NLHE High Roller Heads-Up), to win $172,500 and his first WCOOP bracelet. This was after a tense final showdown saw him dispatch well-known Austrian grinder ‘0PIGGYBANK’. 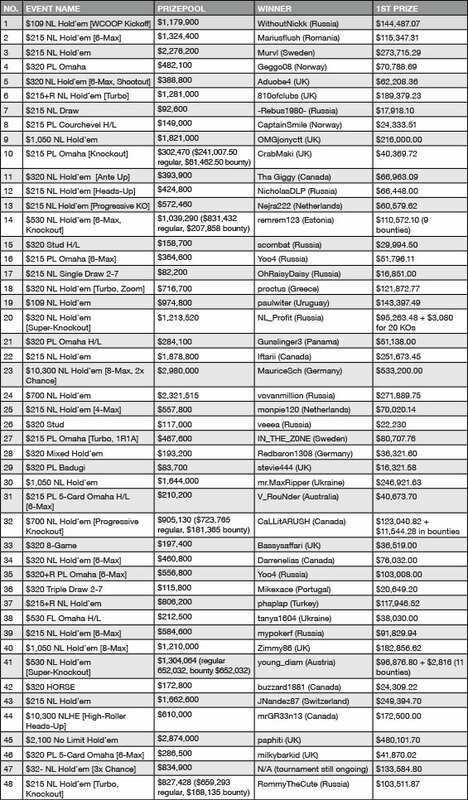 Other big names that ran deep included Alexander ‘Sussie Smith’ Roumeliotis, who placed 4th for $61,000, and Ben ‘Sauce123’ Sulsky, who finished just outside of the money after losing his third match. Last night, however, all eyes were on Event 45 (the $2,100 NL Hold’em). If by some miracle the massive $2,874,000 prizepool wasn’t enough to get your juices flowing, then the survivors list certainly would have been – among the legions of high-stakes celebrities that ended up going into Day 2 were Team Pros Johnny Lodden, Bertrand ‘ElkY’ Grospellier, Lex Veldhuis, and Randy ‘nanonoko’ Lew, as well as Mike ‘Timex’ McDonald, Steve ‘zugwat’ Silverman, Ignat ‘0human0’ Liviu, Ana Marquez, David ‘Gunslinger3’ Bach , and last but certainly not least, poker rock star Phil ‘RaiseOnce’ Ivey. Ivey’s stack yo-yo’ed dramatically after going on a cycle of losses and double-ups, before he was finally eliminated in 57th by eventual 3rd place finisher ‘lilholdem954’. Notable players who finished above the king of poker included Ana Marquez (37th), ‘Zugwat’ (29th), ‘nanonoko’ (27th), and ‘Timex’ (18th). Team Pro member Johnny Lodden’s chances looked favourable after seeming to sit comfortably in the top 3 for much of Day 2, but the Norwegian pro ended up being eliminated a hair’s breadth away from the final table in 13th place for $19,112.10. His departure saw the battle rage on, and after hours of fierce play the top prize of $480,101.70 went to UK player ‘paphiti’. Finally, another poker celebrity – in this case, British high-stakes superstar Ben ‘milkybarkid’ Grundy – came out to play in Event 46 (the $320 PL 5-Card Omaha). Grundy took home first place and a payday of $41,870.02 for his troubles. Man of the moment ‘Rebus1980’ nabbed 4th place in the same event, strengthening his already hefty lead in the race to be named WCOOP Player of the Series. ‘Rebus’ currently sits at the top after a stupendous 12 cashes (including a win in Event 7). The Russian has 390 points to runner-up ‘Sykoen’s 280, meaning that he will be tough to topple – but stranger things have definitely happened, so stay tuned. At Bluff HQ, we can’t believe that one of the most fun and explosive online tournament series’ of the year is two-thirds finished already. But as some wise soul once said, it’s not over til the fat lady sings – and that poor dear has plenty to wait for before she can make a peep. There’s still 18 tournaments to go, including of course the hotly awaited Main Event, which this year promises an absolutely stonking $8 million guarantee. We’ll see you at the rail. There are still tons of fantastic tournaments and cash bonuses on offer, so sign up to PokerStars and get playing today!